Pamper evenings are definitely the one thing I love to do the most. It clears my mind after a bad day or cheers me up if I am in a low mood and for me, there is no pamper without a great face mask while you relax in the bath for 15 minutes. It really changes everything and makes me feel million times better. 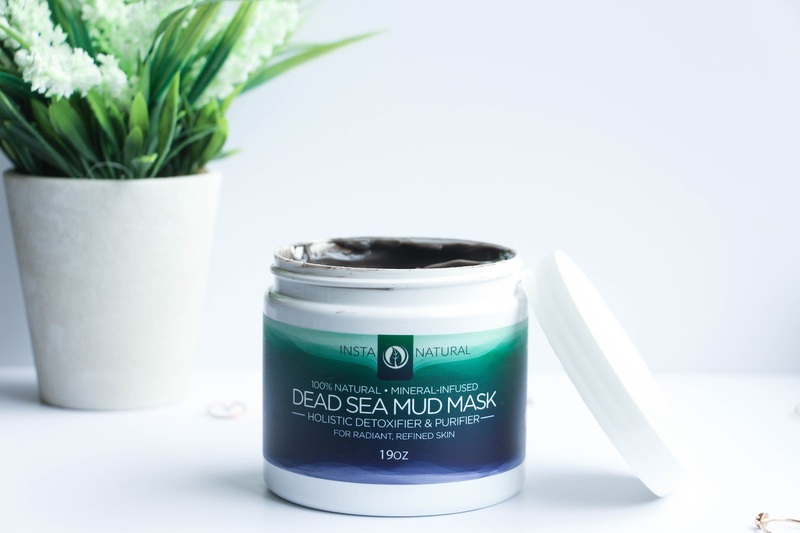 I have recently added to my routine a new product that I have been excited to tell you all about – the InstaNatural Dead Sea Mud Mask. InstaNatural is a brand that is sold online and mainly in the US but they have a great variety of products on Amazon UK where you can expect a very quick delivery. I got this face mask from Amazon and I had a great experience. All their products are 100% natural and that is something I love about this – no alcohols, sulfate or parabens. Now talking about the face mask itself, this is a 100% natural mud mask that detoxifies and purifies your skin. The main ingredient is pure dead sea mud that contains a big number of minerals that are beneficial to the skin, working to absorb excess oil, dirt and toxins from the skin. It is also great to expunge acne, pimples and blackheads. I use this mud mask only on my face but it can also be used on your body if that is something you want to do. Believe me, the packaging is big enough to rub it all over you and you will still have a good amount left! When applying a thin layer to my skin, it feels really cold and refreshing, I feel like I am putting a cold cloth on my face and for me that feels amazing and relaxing. It is like a wake up call for my skin to rejuvenate. I leave it on for 10 to 15 minutes, until it is dry. Then, I remove it with warm water in circular motions and pat dry with a clean cloth. I honestly feel my skin much softer, healthier and with an even skin tone. This face mask also helps to reduce pores and I do notice that, specially when applying my makeup! Even when not applying the Benefit POREfessional, my makeup applies evenly and seamlessly. I only use this mask once a week as it is what they recommend but I wish I could use it more as I do love it and feel like new after applying it. This will definitely be a product that I will repurchase and you know what is funny? My boyfriend loves it too! Actually, he was the one that purchased this bad boy as he is now worse than me when it comes to skin care! When did a man have more face creams than a woman? My boyfriend has! Anyways, I do love this mud mask and I honestly recommend it to anyone, no matter what skin type you have. It does wonders to my skin and I never skin a week without applying it.